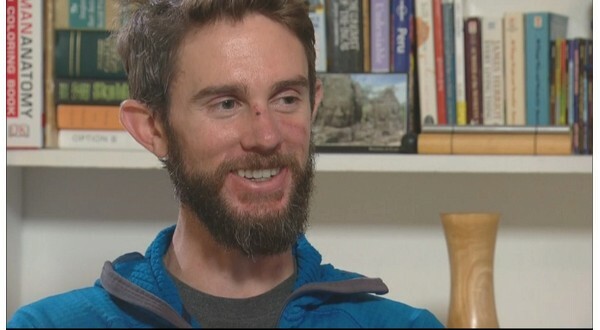 A former Mountain Home resident, now living in Colorado, who survived a mountain lion attack says he knew he had to do something drastic when the young cat's jaws stayed clamped on his wrist as he pounded its head with a rock. Thirty-one-year-old Travis Kauffman says that he got one foot onto the cat's neck and held it there as the animal thrashed. Eventually, the animal stopped moving, and Kauffman pulled out his arm and scrambled away. He told reporters Thursday he also tried stabbing the animal with twigs, but nothing worked until he stepped on its neck. After the mountain lion stopped moving and opened its jaws, he said he was able to scramble back up the hill "and get the heck out of Dodge." According to a news release by Colorado Parks and Wildlife, Kauffman received more than 20 stitches to his face and suffered contusions and puncture wounds to his neck and legs that did not require stitches. Kauffman, who has been living with his girlfriend the past five years in Fort Collins and works in environmental consulting, loves outdoor recreation including skiing, mountain biking and trail running.